Client "Turning-down for an Update"
Sometimes, the most unpretentious, simple projects, turn out the most beautifully. This was just that project. Simple updates, have wholly transformed this space. Our goal was to update the bed, address their specific sleep needs, make it beautiful, create a cohesive flow from their newly remodeled master bath, while defining spaces that were cozy and warm, yet fresh, and worthy of spending time in. These wonderful clients booked a Turndown Service appointment, and were thrilled with the end result. They came home from vacation to a brand new, master retreat, completely installed. So, are you ready? This is a fun before and after. Client "Turning-down for an Update" in McLean, VA, the after. Turndown Service and Design by Valerianne of DC. In all, we replaced the bed with a custom upholstered headboard and new bedskirt, added a new, custom sized rug, new nightstands and lighting, all new bedding, we reupholstered a sentimental chair (and added the pillow), and reupholstered the existing bench at the foot of the bed. All of our selections were made with the intent of working with the client's existing dresser and chest (not in this picture.) In addition to addressing the bedroom, we also worked with the clients to refresh the attached sitting room. The sitting room, attached to the master bedroom in our Client "Turning-down for an Update" in McLean, VA. The sitting room after in Client "Turning-down for an Update" in McLean, VA. Turndown Service and Design by Valerianne of DC. Our goal here was to help the client's define this space so that they can use it. As it stood previously, the sitting room was not being used at all. Now it's a comfortable place to sit and read, or talk, even work. We helped the client select chairs and fabric, made custom pillows, reupholstered the desk chair, and helped them incorporate existing items such as the rug, desk, table, lamps, and mirrors. Master Sitting Room Chair in Client "Turning-down for an Update" in McLean, VA. Turndown Service and Design by Valerianne of DC. Custom pillow in the sitting room chairs of client "Turning-down for an Update" in McLean, VA. Turndown Service and Design by Valerianne of DC. We love how the space came together, and we hope you will too. More detailed photos below and a link to the client's review of our Turndown Service! Custom headboard, bedskirt, and rug with new bedding by SDH in client "Turning-down for an Update" in McLean, VA. Turndown Service and Design by Valerianne of DC. 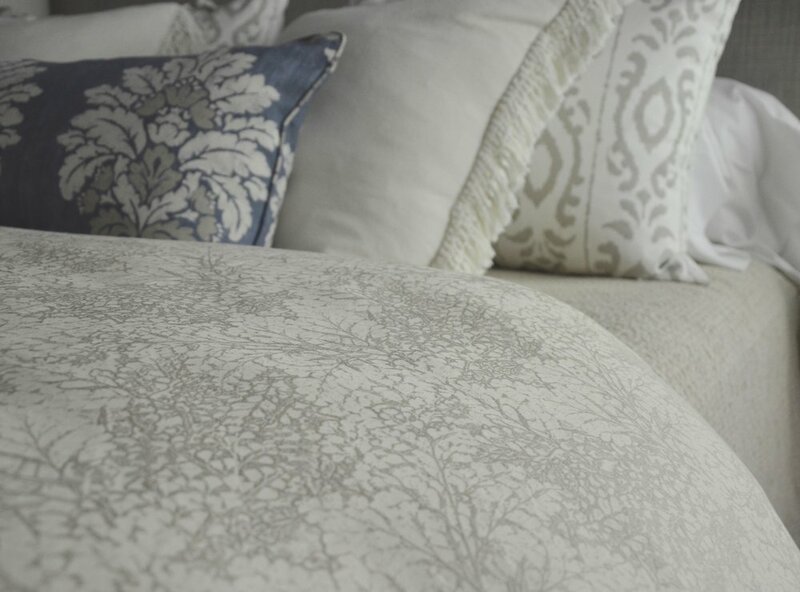 Duevet cover and bedding detail from our latest Turndown Service in McLean, VA, featuring SDH bedding. Turndown Service and Design by Valerianne of DC. Sentimental chair reupholstery, updated nightstands and table lamps, turndown swag bag in our client "Turning-down for an Update" in McLean, VA. Turndown Service and Design by Valerianne of DC. Thanks for having us work in your home Chris, it was such a pleasure!